Short version: Marathon #7 Great race, well supported, warm for me but PR!!!! 4:21. Super happy about this, my last marathon PR was in NYC November 2013. I ran Vancouver, BC and Chicago last year with no PR. About mile 24. Thanks for the pic Travis! I went to Eugene with my friend, Amy. We arrived about 12:30 Saturday and went straight to the Expo. It was very small. Amy and I thought this sign was funny. And yes people were buying plants. We quickly picked up our bibs and shirts then headed to McMenamins for a lunch of burgers. 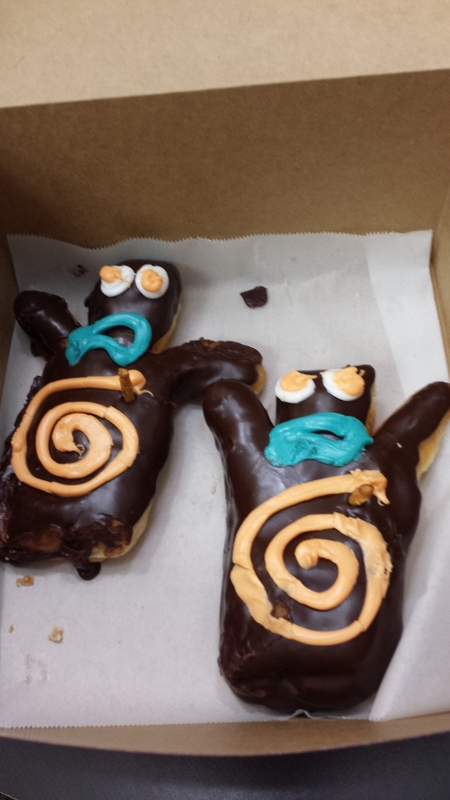 Then we stopped at Voo Doo Donuts! We checked into our hotel, the Holiday Inn Express. 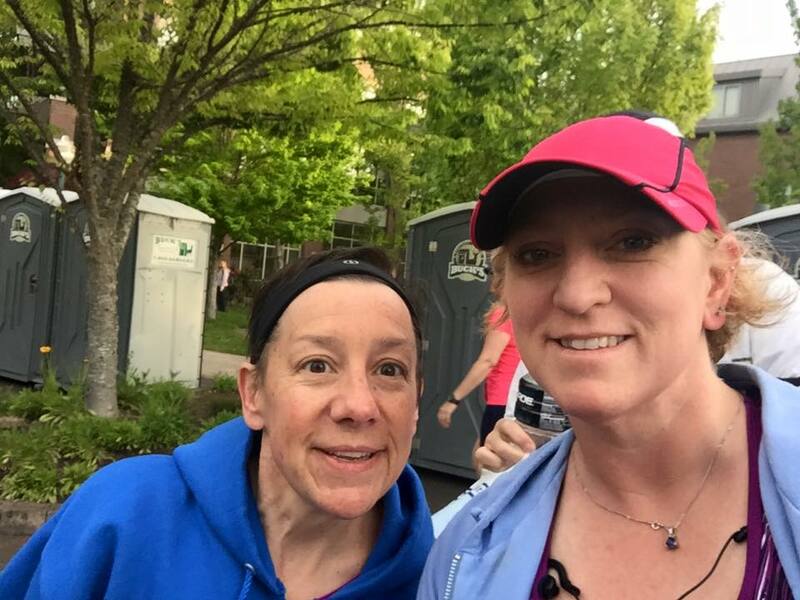 We could walk to the start/finish line, which is super helpful. They also gave us a late check out of 2 pm and had breakfast open at 5:30 on race day! We went back downtown and shopped at the Saturday Market and the 5th Street stores. 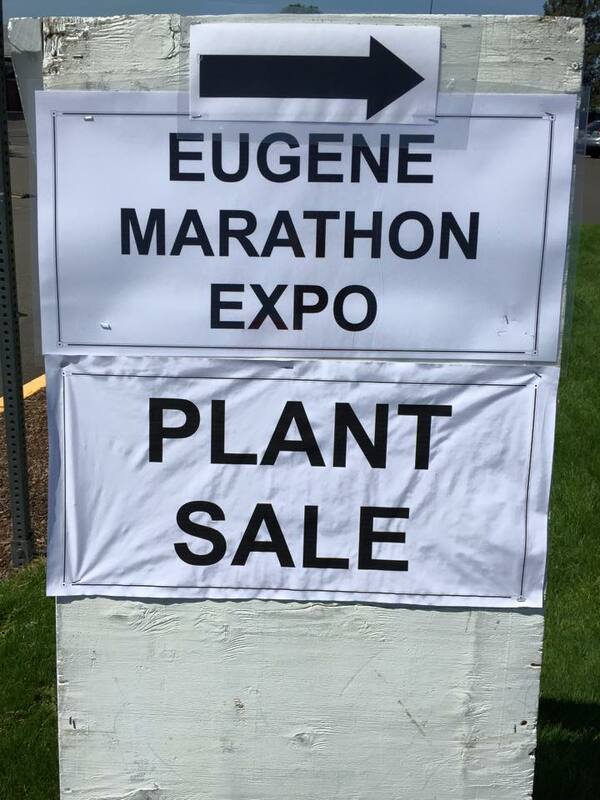 Eugene is a college, hippy town. We stumbled across a great restaurant for dinner, Ambrosia. It was modern Italian and very good. We got up at 5:30 on Sunday, got coffee and a bagel in the lobby and headed over to the start at 6:30 for a 7 am start. It was already a little warm about 55 degrees, but it was partly cloudy which helped during the race. I think we started a few minutes late and I was in corral D. The 4:40 pacer was in C. I never saw another pacer after I past him in mile 1. Amy and I at the start. Amy’s pic. The race went through some neighborhoods and along the river, on bike trails. It was a very nice course. Mostly flat, a few rolling hills and a bigger hill at mile 8. There was lots of shade, which I loved and water stops every 2 miles at the beginning, but I think almost every mile towards the end. I felt good most of the race. I started a little too fast, but slowed down quickly. And stayed in a good groove for about 22 miles. The volunteers were great and the police officers along the course were the best I have ever encountered on a race. I was getting tired at mile 22 and it was warmer about 65. This is when I heard someone call my name. We had our names on our bibs so at first I thought it was a stranger, but I looked up and it was Travis, my friend Marilyn’s husband! It was so good to see a friendly face. We chatted a few minutes and he told me I looked good, and I told him I didn’t feel good. He was on a bike and I saw him a few other times those last few long miles. It was the pick me up I needed. Thank you Travis! The last 2 miles were hard. I only walked through the short water stops. I knew I had a PR and did not want to see it slip away. I just kept moving. I came onto the track at Hayward field and the finish still seemed so far away. I tried to sprint, but had nothing left. Official time 4:21:03! 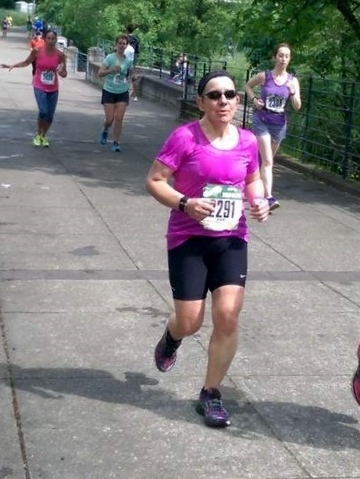 A PR of 4 minutes! At the finish I was given chocolate milk, which the volunteer opened for me, my medal, a bag with water, bagel, PB, cookie and nuts. Next up Mt St Helens climb in 2 weeks! 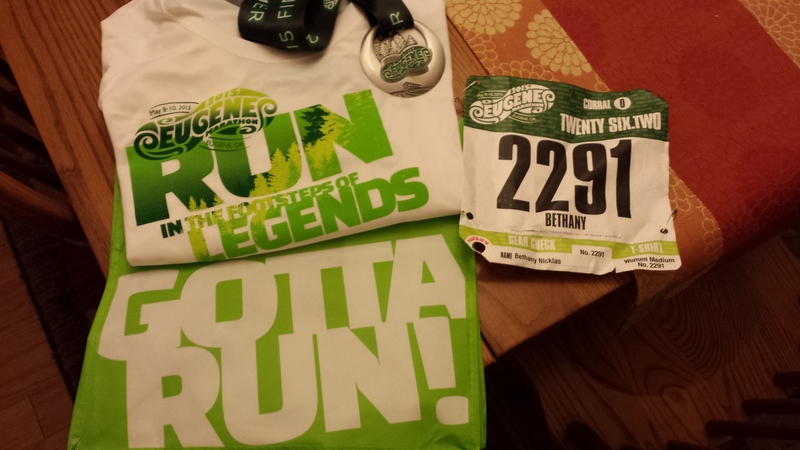 This entry was posted in Uncategorized and tagged Eugene Marathon, marathons, Running. Bookmark the permalink. Congrats on your PR!!! What’s your next race? I am so glad you had such a great race and that Travis was able to encourage you! When he rode by me, all I could think was I wanted to push him off and steal the bike! 🙂 Congrats on the well-deserved PR! Thanks! He was the boost I needed to stay on track.